Michael and Danni Fox of Statesville, North Carolina won the second event for North Carolina D4 Couples Trail on Mountain Island Reservoir near Charlotte, North Carolina on December 17th, 2016. The Team took first place with a bag weighing 11.16 pounds which included a 3.14 pound kicker. Michael and Danni were a new couple for division 4. We would like to welcome them to the family. This was they’re first time fishing a tournament together and it was a good one for them as they took first place. Athens, Al. 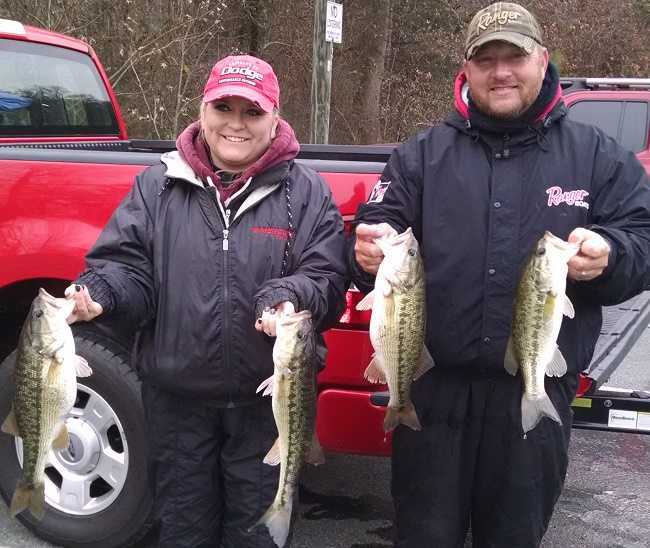 Leisa and Keith Morgan on Lake Norman won the American Bass Anglers - event on out of with five fish weighing 13.22 pounds. It was a very windy day on the lake with steady winds of 12 to 15 mph and gust over 25 mph. This made it very difficult to travel around the lake. However, the fishing seemed to be good. The team of Chris Koons and Jennifer Nicol took home the second place money with a bag weighing 11.96 pounds and a kicker bass that weighed 2.96 pounds. Keith and Leisa Morgan won the first place pot with a bag of bass weighing 13.22 pounds including the two kickers.